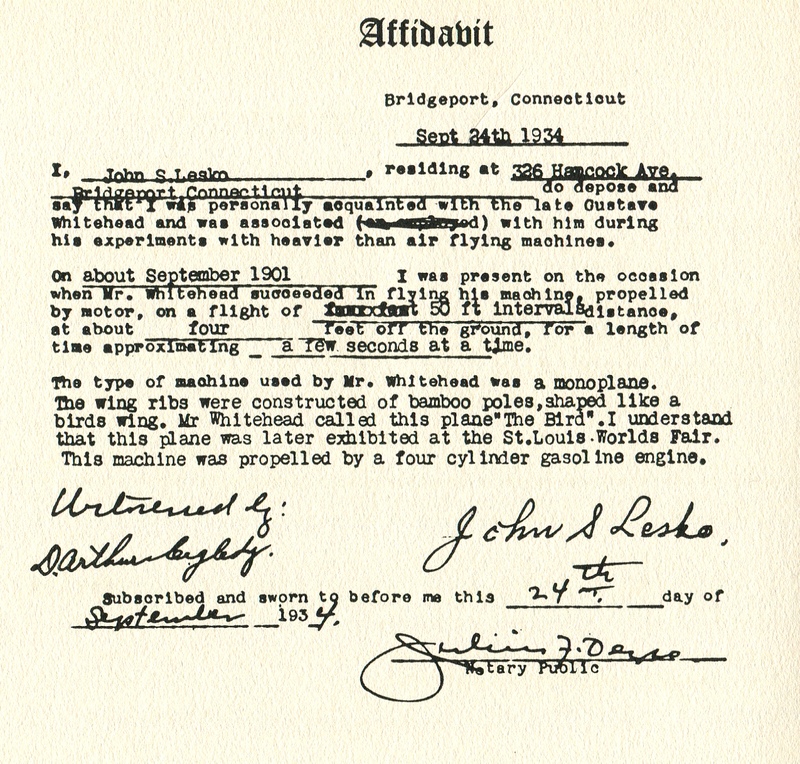 I, John S. Lesko, residing at 326 Hancock Avenue, Bridgeport Connecticut do depose and say that I was personally acquainted with the late Gustave Whitehead, and was associated with him during his experiments with heavier than air flying machines. On about September 1901 I was present on the occasion when Mr. Whitehead succeeded in flying his machine, propelled by motor, on a flight of 50 ft intervals distance, at about four feet off the ground for a length of time approximating a few seconds at a time. The type of machine used by Mr. Whitehead was a monoplane. The wing ribs were constructed of bamboo poles shaped like a birds wing. Mr. Whitehead called this plane “The Bird”. I understand that this plane was later exhibited at the St. Louis Worlds Fair. This machine was propelled by a four cylinder gasoline engine.